Chokeberries (Aronia) are a great example of those fruits that both taste good and show a number of health benefits for the body. Chokeberries' rich antioxidant content may be beneficial as a dietary preventative for reducing the risk of diseases caused by oxidative stress. Among the models under evaluation where preliminary results show benefits of chokeberry anthocyanins are colorectal cancer, chronic inflammation, gastric mucosal disorders (peptic ulcer),eye inflammation (uveitis) and liver failure cardiovascular disease. Now Drs. Bolin Qin and Richard Anderson from the US Department of Agriculture in Beltsville, MD, have come up with some more interesting info about chokeberries, i.e., "chokeberry extract reduces weight gain in insulin-resistant animals". 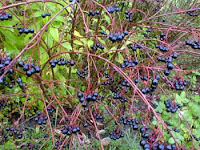 Qin and Anderson found that at the end of the study, the rats consuming the chokeberry-spiked water weighed less than the controls; both levels of chokeberry had the same effect in this regard. Similar beneficial effects of chokeberry consumption were found for body fat (specifically, that of the lower abdominal region). 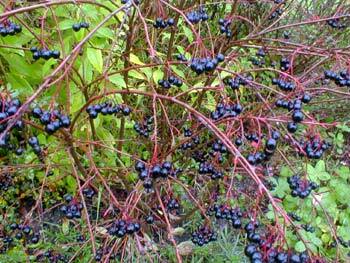 They also discovered that animals that had been drinking chokeberry extract had lower blood glucose and reduced levels of plasma triglycerides, cholesterol, and low-density lipoprotein (LDL) cholesterol when compared to the control animals. These alterations would theoretically lead to lower risk for diabetes and cardiovascular disease in humans. To add even more evidence for a healthful impact of this super-berry, the researchers documented numerous alterations in expression of genes that would likely lead to reduced chronic inflammation and perhaps even lower cancer risk. For instance, drinking chokeberry extract lowered expression of the gene coding for interleukin-6 (IL-6), a protein that normally triggers inflammation following trauma or infection. Chronic overproduction of IL-6 has been documented in many diseases such as diabetes, arthritis, and atherosclerosis and is thought to be a partial cause of these conditions. Thanx for visit and ur interest in my blog. U are always welcome to my blog and have ur valuable comments..